Lately Sephora has been doing these weekly deals where you can get a normally higher priced item for a clearance price. Some of the things they've had are Smashbox lipglosses and eyeliner palettes, lotions, travel items, Boscia blotting linens, stuff like that. 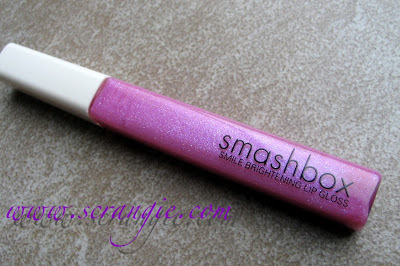 One of the more recent specials is this Smashbox Smile Brightening Lip Gloss- only $5 for Smashbox! I love Smashbox so I got it- always love these lower-priced items for getting my order up to free shipping level! It claims that the blue-based pink shade will make your teeth look brighter and whiter. That's an age-old beauty trick that works to some extent, but it's nothing dramatic. 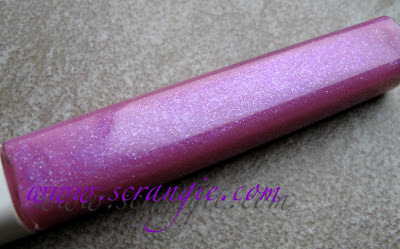 Still, it's a nice added benefit to what's really just a gorgeous sparkly pink gloss. Please do enlarge these to see the detail. 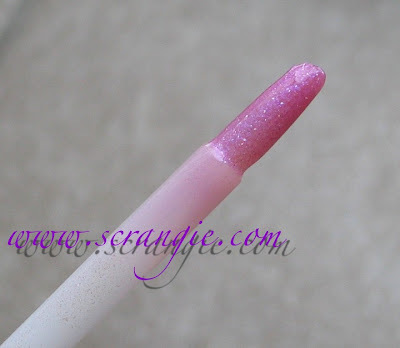 What you have is a light cool pink gloss with tiny silver glitter and a wicked awesome blue-violet duochrome pearl shimmer. It is insane. When it arrived and I first saw it in person I flipped out. One of the coolest glosses ever. And while it looks outrageous in the tube, the end result on lips is very wearable. Check out that sweet blue duochrome. It's not enough to make you look hypothermic, but it is enough to give that fabled tooth-whitening illusion. The gloss is rather sheer and the silver particles are much more sparse on the lips than they are in the tube. The gloss is mint flavored and leaves a cooling, tingly sensation on my lips for quite a long time. It's very shiny and doesn't feel drying or overly sticky. Smashbox glosses generally run on the smooth/silky texture yet shorter wearing end of the gloss spectrum, but this one seems to have a little extra thickness to it. Still, I don't expect a lip gloss to stay on for more than an hour or two. I'm satisfied with the wear time on this. I have to mention how much I love the tube. It has a sleek shape and the white cap looks great. It reminds me of the Holiday gloss set they did a while back- what was it called, Rapture or something like that? Loved those, love this. Oh, and in case you're wondering, it's a full size. Full size Smashbox gloss for $5. You can't even get most drugstore brands for $5. 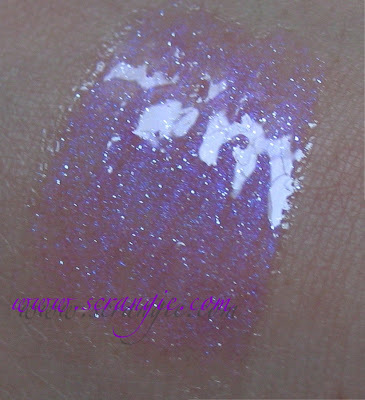 Now it seems like my blog is becoming a Sephora-fest this week... Next thing I review won't be something from Sephora. Still really enjoying doing more makeup reviews than usual. The lipgloss is very gloss and glittery! I think I have something like this. Super pretty! I love an unexpected hint of blue or silver in gloss. Very pretty shade of pink. I haven't worn Smashbox for a long time. I still have quite a few of their glosses. Love them!